This level of cuisine is totally not what you would expect when you walk in. Possibly 12-15 tables MAX, with chalkboards and TVs imply a fun place to watch a game and grab a beer with your peeps. But take a look at the menu at Pintxos Pour House and items like "Duck Confit Bruschetta" and "Scallop BLT" beg you to think otherwise. This is in a growing part of Winston-Salem (that has been developing for years), and is continuing to expand. It's not terribly far down Robinhood Road towards Meadowlark, and believe me, you'll want to make the drive out there. Treat yourself to a beer cocktail like the Great Chicago Fire, which combines Goose Island 312 Wheat Beer and Cinnamon Whiskey. What a brilliant flavor marriage. It's the perfect spicy drink to warm you on a cold night, and you'll be ready to down another one in a matter of minutes. 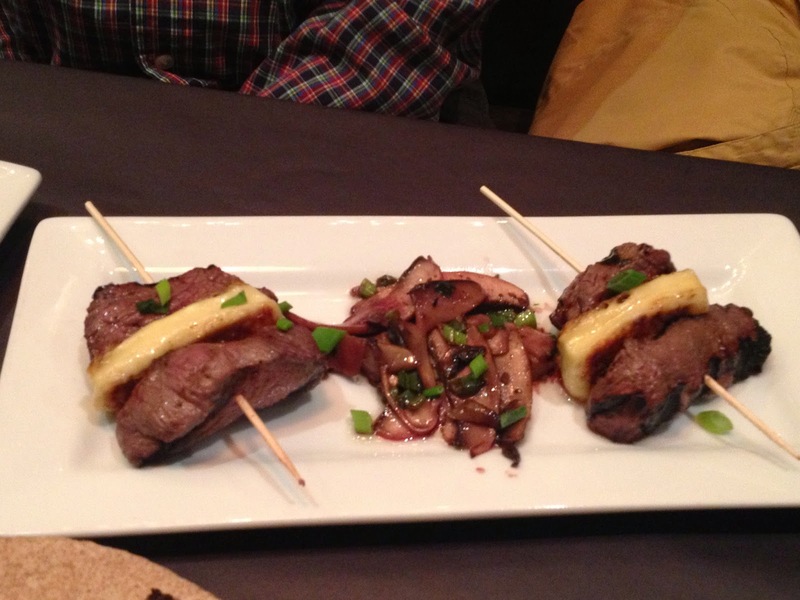 The Antipasta Skewer are a perfect taste of Spain to kick start any meal. Serrano Ham (much like Prosciutto), Manchego Cheese, Genoa Salami, Kalamata Olives and (my faves) Blue Cheese-stuffed Spanish Olives are skewered and served with house made Bread and Butter Pickles. No better way to whet your appetite. Pintxos (pronounced pinchos) are much like tapas. Small portions, small plates, sharing is encouraged. You cannot go wrong with either of the taco selections. It was like choosing my favorite child, deciding which I preferred - the Ahi Tuna Tacos or the Portobella Mushroom Tacos. The former, served with rare Ahi Tuna, slightly sweet Jicama and Mango Slaw with a creamy Chipotle sauce in a flour tortilla is absolutely divine. The sweetness of the slaw provides a nice crunch, and the slight heat from the Chipotle sauce wakes up that tender Ahi. The latter is a vegetarian dream - you won't be missing meat here. 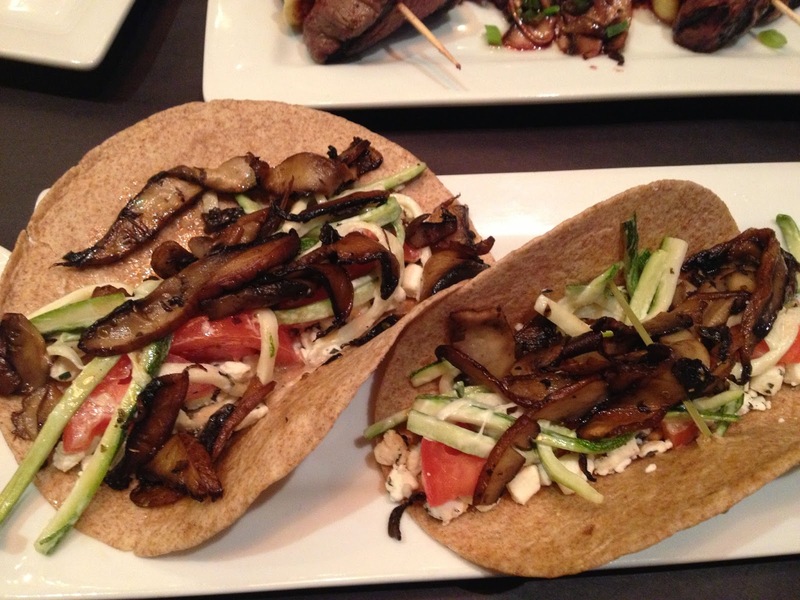 Thinly sliced Portobellas are topped with herbed Goat Cheese, Zucchini, Tomato and Slaw in a whole wheat tortilla. I kid you not, these are as delicious as what you'd find at any taco food truck in Austin. I could rave about these tacos all night, but you'd be better off hopping in your car and driving there already. 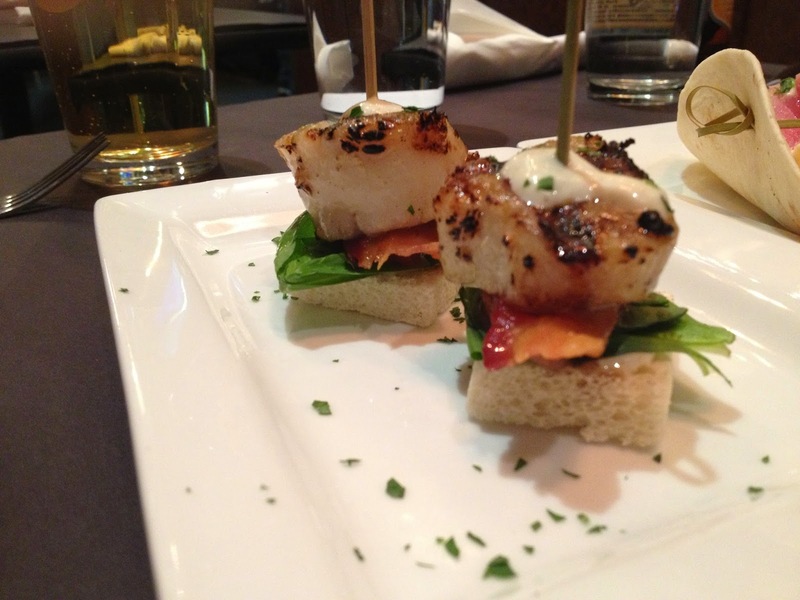 The aforementioned Scallop BLT presents two incredibly tender and juicy Scallops atop Brioche Toast Squares, with all the accompaniments of a traditional BLT - Bacon, Spinach, Tomato and instead of mayo, a tangy Lemon Peppercorn Aioli. I could have scarfed down 15 of them. One of the more inventive dishes, Grilled Steak Skewers with Juusto Cheese (a thick, baked cheese) is marinated in red wine and served with thinly sliced Portobellos. The level of acid in this dish is perfect, and the steak is medium rare. All portions were consistently larger than I was expecting. 5 plates was plenty for 3 people. Juusto the right amount of flavor. My favorite part about pintxos or tapas is that you kind of graze - a little of this, a little of that, a lot of variety. How many meals can you have tuna, steak, scallops, salami, serrano ham and portobellas and not feel stuffed afterwards? For those of you who have been to Gia in Greensboro, the environment at Pintxo's is much more casual. I'm so glad Winston has a place like this again (RIP Mundo).